n-Track Studio allows to use your computer as a complete recording studio. 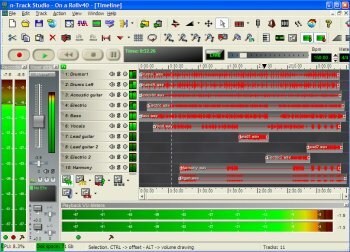 You can record and playback a virtually unlimited number of audio and MIDI tracks, depending on your computer's speed. Realtime Audio effects can be added to each track, to the master, group or aux channels non-destructively: you can adjust the effect settings and listen to the result in real time. Besides its native effects (Reverb, Compression, EQ, Echo, Auto volume, Pitch Shift and Chorus) the program also supports third party DirectX and VST 2.0 plug-ins. The program works with any standard or multichannel 16 and 24 bit soundcards at sampling frequencies up to 192 Khz. As usual its been updated since the topic was posted! N Track is always the program that starts and finishes all my sound projects. I may have to use Sound Forge and/or Audacity for a file conversion but I go right back to N Track to work with it. I have several other recording programs and they become very complicated compared to N Track. i use this program constantly. This update is flawed as it always asks if you wish for it to remove the prior version and not change any settings. This update will not let you install it til you remove the last version.